Quarterback Kirk Cousins has a grocery list full of reasons why he chose the Vikings and it starts with a desire to win. 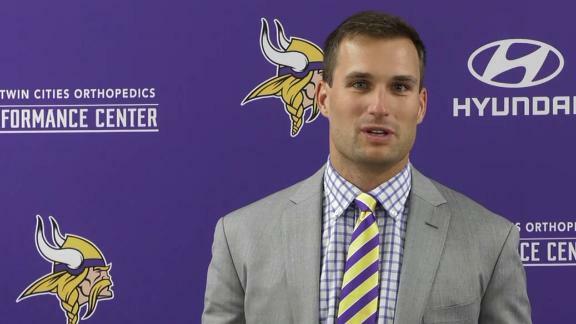 Quarterback Kirk Cousins has a grocery list full of reasons why he chose the Vikings. In the coming years, he'll have a chance to justify the long list he wrote. The former Washington Redskins quarterback had the opportunity to choose his team for the first time since 2007. A fourth round draft pick out of Michigan State in 2012, Cousins was franchise tagged for each of the past two seasons in Washington. This offseason, his services hit the market for 31 other teams. With the Vikings reaching the NFC Championship in 2017, Cousins believes he found the right match. "Winning is what I said it would be all about and it's true. I came here because of the chance to win,” Cousins said. Cousins signed a three-year, $84 million fully guaranteed contract on Thursday and will become the Vikings’ 19th quarterback to take a snap since 2000. It’s why the front office spent cash as they searched for a franchise option. “Our number one priority going into the offseason was to solidify the quarterback position,” Vikings GM Rick Spielman said. The Vikings were paying attention, but little did they know, Cousins was too. The top free-agent watched the Vikings from afar and was impressed with the culture in the locker room and front office. The quarterback was selected to the Pro Bowl in 2017 and had the chance to work with five Vikings players. During those moments, he saw a glimpse into the culture Mike Zimmer and Co. have built in Minnesota. "I could tell right away that some of the best players on the Vikings are also some of the best men and best leaders,” Cousins said. Cousins self-toured Minnesota during Super Bowl week and took advantage of the opportunity to get familiar with the city. He drove to Winter Park, Eagan, and wandered Radio Row at the Mall of America. Just over a month later, Cousins signed the first fully guaranteed contract in NFL history, making him the highest-paid quarterback in the league. He joins the Vikings after starting each of the past three seasons in Washington. Cousins completed 65.5 percent of his passes for 16,206 yards, 99 touchdowns and 55 interceptions in six total seasons. He has passed for more than 4,000 yards and 25 touchdowns in each of the past three seasons, a feat which has occurred just three times in the history of the Minnesota Vikings franchise. The contract might be signed, but the real work is just starting for Cousins, who will reach out to all of his new teammates in the coming weeks. Entering the offseason, a top priority for the Vikings was to find a franchise quarterback to build around for the foreseeable future. Cousins, 29, will enter a stable situation with a talented set of skill players and new offensive coordinator, John DeFilippo. Even Cousins' new head coach is happy he’ll be crafting gameplans with Cousins, rather than against him. Mike Zimmer said he did extensive research on the new quarterback, calling former coaches who worked with or coached against Cousins. He liked what he found: a player who has always been considered an underdog. Nobody knows how this contract will turn out, but Cousins and the Vikings view this marriage as a chance to build a legacy stretching into the future. The quarterback has a chance to prove he is worth the money, something Cousins hopes will keep him around the Twin Cities for years to come. “This is a three-year deal, but the expectation from both sides is that we raise our kids here and we stay for a long, long time,” Cousins said. “This is a lifetime deal. That's the goal."